For anyone responsible for the maintenance of a flat commercial roof, low spots/potential ponding areas are often their worst nightmare. Low spots can quickly progress from a simple unsightly area to being a home for ponding water, leaks, and more. It can be easy to just blame the roofer or builder, but oftentimes low areas/potential ponding areas develop even after the most careful construction. 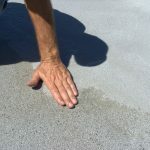 Here are some common causes of low areas on flat roofs that you might not be aware of. 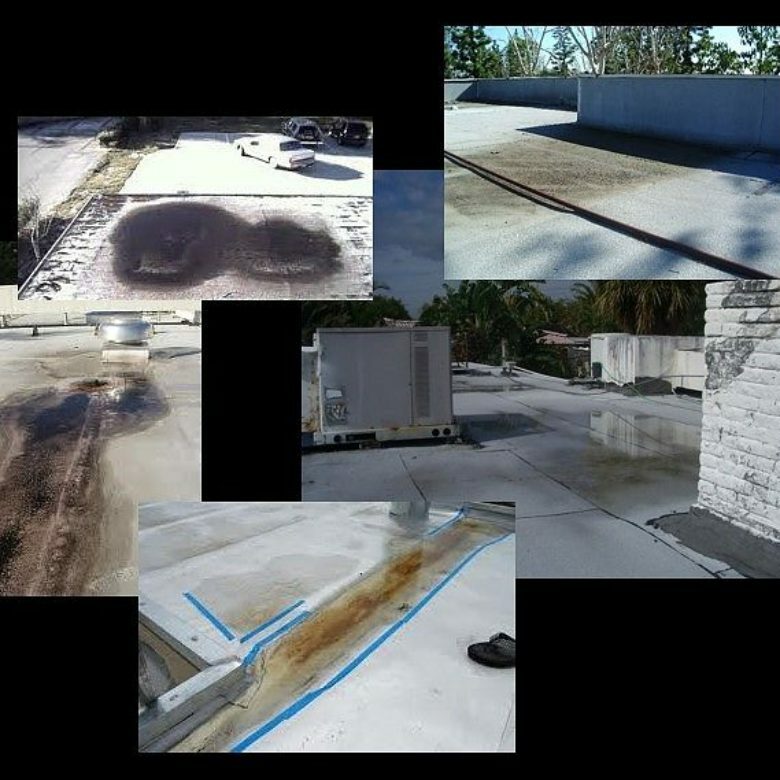 What actually causes low spots on flat roofs? If you have ever lived in a new home, you’ve probably heard the occasional slight creaking – that’s the sound of the building slowly settling into its foundation. Settling is a natural process that occurs over time, where your home or building sinks into the ground. This occurs in every building, and usually does not cause major damages. 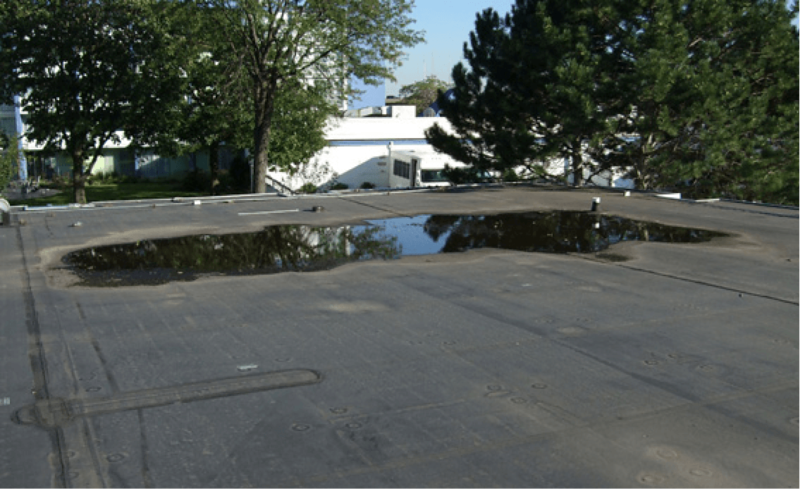 However, large commercial buildings undergo the same process, and if those buildings have a flat roof then in some cases this can result in low spots forming. This especially occurs in buildings with concrete foundations; as the concrete cracks and settles, parts of the building can end up being minutely lower than other parts, resulting in minor low areas of the roof. While we might look at the ground and see it as a picture-perfect stationary object, that is actually not the case. The soil undergoes freeze and thaw cycles as the seasons change, and this expansion/contraction can actually contribute to the natural settling process every building undergoes. Even extensive periods of rain can cause swelling of the soil, which affects a building’s foundation. And let’s not forget the most substantial earth shift of all – earthquakes. An earthquake can cause a very traumatic “settling” of a building, or even cause parts of the building’s structure to collapse, which can easily create low spots in a roof. As mentioned before, settling can cause low areas in a flat roof, so earth shift just exacerbates that problem. Every roof contains insulation, and if that insulation is improperly sealed from the outside elements or if it undergoes unusual compression, the integrity of the insulation’s structure is compromised. A common way this occurs is through a leak; water gains access to the insulation through a breach in the roofing material and saturates the insulation. This heavier insulation is degraded and sags down, which in turn creates a low spot in the roof. Compressed insulation causes a similar problem, and it occurs when heavy equipment essentially smashes the insulation. This can easily occur during repair projects or during regular maintenance of your HVAC units, for example. Unfortunately, low areas can often be created from as simple a problem as inadequate or blocked drainage. If your roof doesn’t have a functioning drainage system, including working gutters, then when it rains the water will have nowhere to go. If you give water the chance to sit on your roof, even if just for a few days, it can cause a slight depression in the roof. It’s that easy – you’ve just caused a slope in your roof that will now get worse with every storm. Every time it rains, even if the drainage system is repaired, water will pool in that low area. You might not think of concrete as being subject to thermal expansion or contraction, but it does occur. Every building material, in fact, will slightly expand or contract according to temperature changes. While most of the time this is a natural process that doesn’t cause substantial problems, these thermal changes can sometimes cause deformations to the building’s structure. A roof can easily sag under a deformed structural component, so it’s good to know the thermal properties of the material your building is constructed from. 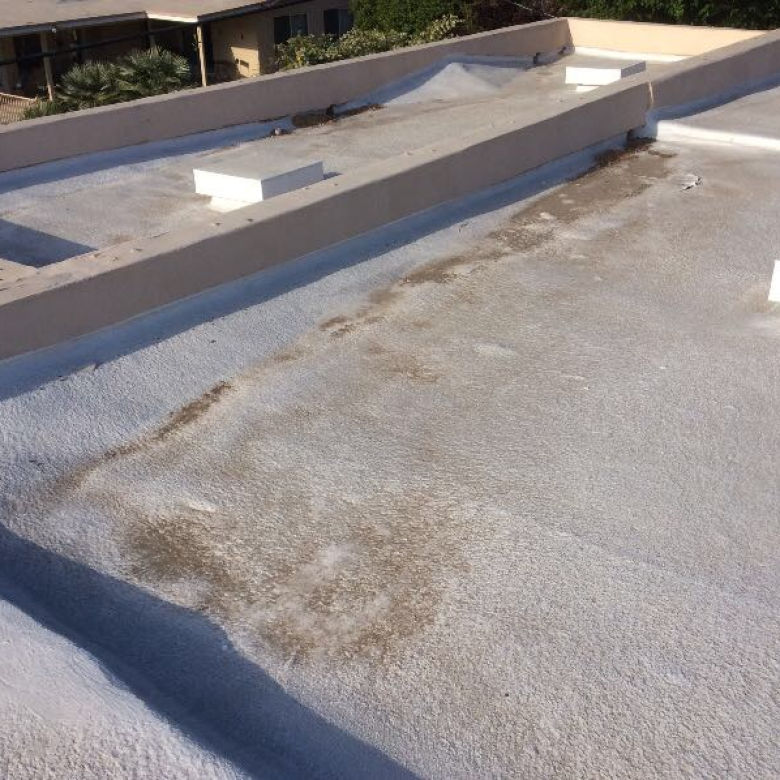 Regretfully, low spots are quite a common problem in flat commercial roofs. However, due to the extensive and oftentimes very expensive problems they can cause down the road, you definitely do not want to let them stick around long. 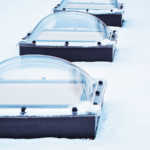 Check out our solutions to fixing low areas on flat roofs, and save yourself a giant headache down the road. Depending on your roofing needs, our product can be applied and fully effective within 24 hours. For more information on low areas or help on how to get rid of them, please feel free to contact us!